A fun Ace Race ® golf team building event for Depuy Synthes in Philadelphia, Pennsylvania. On June 14, 2016, Johnson & Johnson’s Philadelphia, Pennsylvania location for Depuy Synthes held a high-energy, engaging after-hours golf team building event with a philanthropic twist. The event was planned and coordinated between the Customer Support Supervisor at Johnson & Johnson Health Care Systems Inc.; the Depuy Synthes Evaluations-Trauma/CMF Supervisor in Colorado; the Depuy Synthes’ customer service supervisor; and Michelle Riklan, National Instructor for The Leader’s Institute ®. Michelle arrived on the scene with tons of “interesting items” including golf greens, holes, putts, art supplies, cans of food, and boxes of non-perishable food items. The teams were broken up and mixed so individuals who did not know each other as well had opportunity to work with each other. We had six teams of approximately five participants. 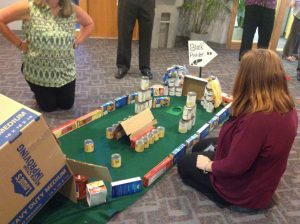 The teams worked together, cheered each other on, created interesting markers for their individual greens and then each team built a mini-golf hole out of the supplied food. At the end, we had a competitive miniature golf course and the teams competed to get through the course with hole-in-ones. It was a noisy event! Lots of laughter, lots of cheering. A Fun Golf Team Building Event for Depuy Synthes in Philadelphia. All food was donated to a local food bank chosen by Johnson & Johnson. The Leader’s Institute ® received positive feedback stating that the event was “FANTASTIC!” and very well received by all participants. If you are interested in a fun and competitive team building activity like the Ace Race ®, call us toll-free at (800) 872-7830 for details. Or, if you are in the healthcare industry, contact The Leader’s Institute ® for Healthcare (https://www.tlihealthcare.com) at (800) 872-7830 x109, and one of our healthcare specialists can help you!